Excellent native pollinator plant with long, bottlebrush-shaped white flowers. 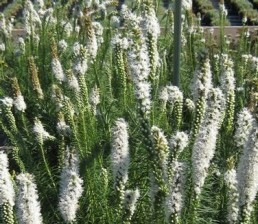 A tall perennial with spectacular, long bottlebrush spikes covered with white flowers. Plants bloom from the top down and can be deadheaded once for a secondary, smaller bloom. Leaves are slender and grass-like.